There's SouleMama! 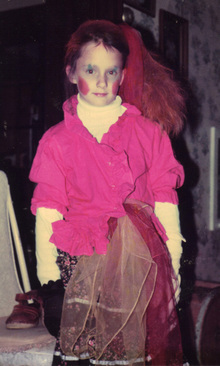 Circa 1984-ish in the midst of a four-year Cyndi Lauper for Halloween binge (you thought Calvin was obsessive). Papa in the Hat from '93 maybe. I called my man Jeffery early this morning requesting pictures of a childhood Halloween when a friend's uncle painted our faces like the rockers from KISS (I was the drummer- Peter). No luck on finding those gems. This has always been a favorite holiday of mine - I think I like it even more as an adult than when I was little. Not so much the sugar barrage as the thrill of being somebody (or something) else for a time. Although, the sugar was a thrill too. 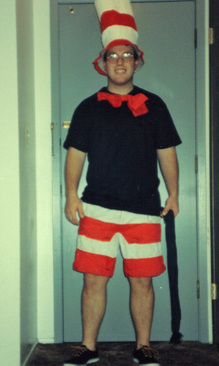 I would eat all of my candy as fast as humanly possible and then harass my brother and sisters for some of theirs. Dad ate the apples. PS - For those of you hunting down kid-size whitewater kayaks - The one in the pictures is actually my boat which i was heavy for about twenty pounds ago (I told you about the candy, right?). Small whitewater boats can be very stable for small children but only if they don't mind tipping over. Check a local boat/ski shop for specific boats and then search for them used at places like boatertalk.com. If they'd rather not tip, go with a wider more stable lake boat or recreational kayak. Either way - get on the water - I highly recommend it as a source. PSS - Amanda will be back VERY soon. You're all being SO patient!